There are two things that we need to know about all the Saints of the Order of St Benedict: that there are lots of them, and that they’re all on our side – they’re praying for us. When we consider the saints, especially in large numbers there can be something decidedly off-putting about it: we’re filled with a sense of our own inadequacy, that we’re not good enough, that we’re not up to the task – sainthood isn’t for us. And so I would like to begin by spending a few moments considering the portion of the Rule which is appointed to be read today, from the second half of Chapter 35 – it concerns those appointed to serve at table for the week. It is quite mundane and practical: they are to eat early, before they serve the brethren so that they do not grumble and it isn’t too hard for them. Before they begin or finish their week of service they are to give thanks to God. It is this reliance upon God which undergirds all that they do from start to finish which provides us with an important spiritual lesson: in knowing upon whom we can rely we can be truly thankful, we can be built up in love, with generous, thankful hearts. That is why in the Prologue to the Rule our Holy Father St Benedict expresses his aim as follows: Constituenda est ergo nobis Dominici schola servitii – we have, therefore to establish a school of the Lord’s service. It is a school: somewhere where things can be both taught and practised, it is a place to learn to serve God and others. To love and to serve God and our neighbour is we are all called to by virtue of our baptism; it is how we live out our faith in our lives. This then is the path to heaven, for saints are sinners who, through God’s love and grace, keep trying, who stay close to Him. So, as we keep trying, we can do so in the knowledge that nothing can separate us from the love of God in Christ Jesus our Lord (Rom 8:39). That’s what the Incarnation, the Cross, and the Resurrection achieve: a relationship of such depth, such love, which has such power to heal and transform our human nature. For all things are possible with God (Mk 10:27) this is why the first word of the Prologue is Ausculta ‘Listen’ we listen so that we might learn; in listening we focus our attention on what really matters so that we can sit lightly to the things of this world, all the superficial stuff that the world tells us is important or valuable, so that we might discard it and concentrate on what really matters. Our listening informs what we are, what we do, and what we shall be. 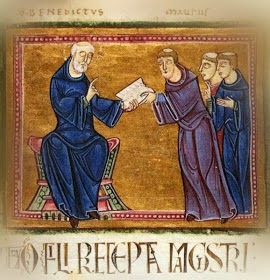 So as we sing the praises of those who have followed in the footsteps of St Benedict, let us imitate them, in the Lord’s service, strengthened by Word and Sacrament – fed by God, fed with God, so that our nature may be transformed, so that through prayer and service we may honour the God who created us, who redeemed us, and who sustains us, so that we may live out our faith so that the world may believe and give glory to God the Father, God the Son, and God the Holy Spirit, to whom be ascribed as is most right and just, all might, majesty, glory, dominion, and power, now and forever.